I’ve always been a fan of anything that trains snowboard muscle memory (especially off the ski slope), so when I first saw the Aratik Board Trainer I knew it was something I had to check out for myself. Matt at Aratik USA was kind enough to send one over for us to check out, so here’s a review of the Aratik Boardsports Trainer. 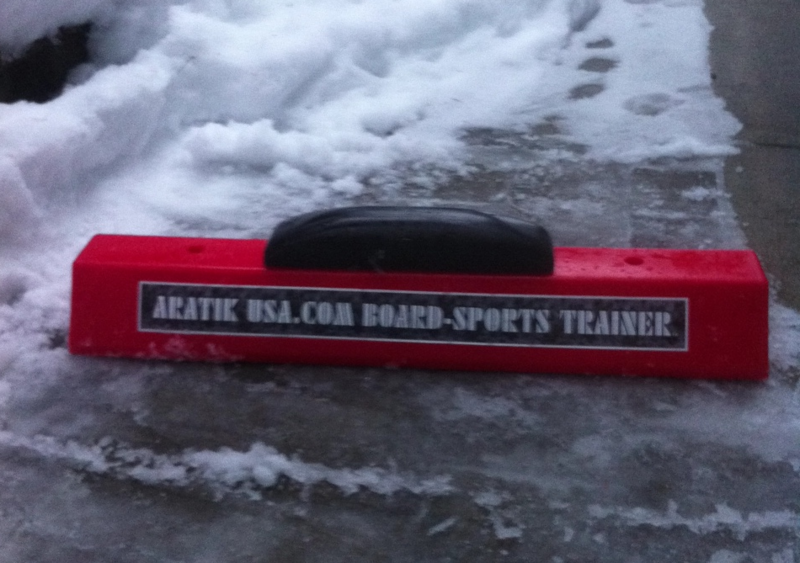 The Aratik Board Trainer is a practice jib box that you can use to train snowboard box/rail tricks off the snow. Basically this means you can put in your yard, garage or even your living room and practice your snowboard jib tricks without any snow. 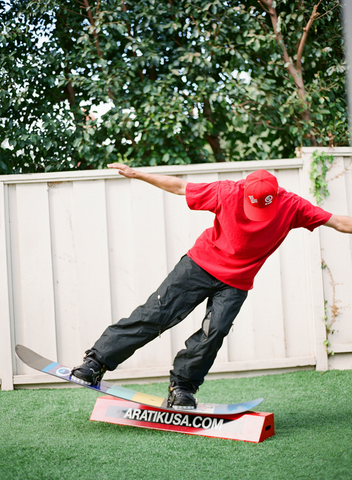 Using the board trainer allows you to learn and practice the movements and technique for a snowboard rail trick before you get to the ski slopes. How exactly do you use the Aratik Board Trainer? Basically you use the board trainer to mimic the same movements you’d make when you hop on/off a box or rail while snowboarding. This means you can practice 50/50s, frontside boardslides, 180s, 270 on/off, presses and basically every other snowboard jib trick you can imagine and slowly build your skills up and learn the technique and feel of each trick. By the way, you don’t even need to practice the basic movements in your snowboard boots like I did. I just didn’t want to change in and out of my snowboard gear. Alright, now that you know what practice jib boxes are used for, on with the review! It’s a pretty simple setup. You have the Aratik board trainer and you have the removable black spin top that you can fit onto the top of the board trainer when you want to up the difficulty or use it to spin onto/off the board trainer. The entire Aratik Boardsports Trainer is made from recycled hard plastic (including the black spin top), which is what allows it to be pretty lightweight but still solid. I checked the entire top surface of the board trainer and couldn’t find any rough or sharp corners that might stab you if you fall, everything on the surface was smooth and well finished. I also tested putting the black spin top into each of the holes along the top of the board trainer and it was a nice tight fit, so no loose bits there. Overall, I’m very happy with the build quality and design of the Aratik Boardsports Trainer. I did do a quick check of the bottom of the board trainer to see how it gripped and it seems their solution was to have a slightly rough surface along the underside of the board trainer. To check the underside grip, I tested the Aratik Board Trainer on both the carpet in the living room and the snowy/icy driveway outside. 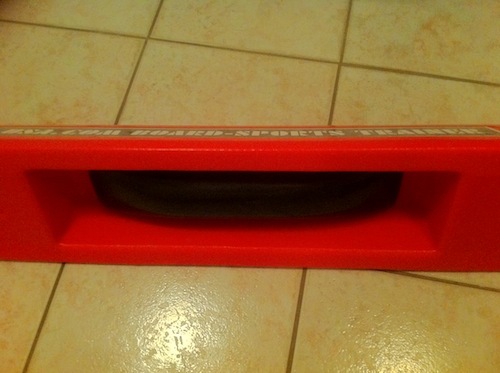 The board trainer gripped great on the carpet, but you definitely have to be careful using it on slippery surfaces. The rough underside can grip to things like lawns, carpet and even fresh, non-icy snow, but on things like hard ice or a tiled floor, there’s no grip. 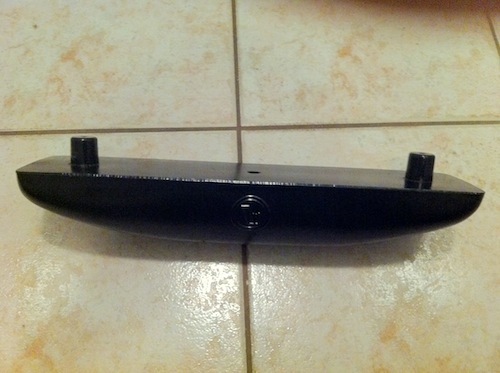 It stayed in place when I used it on my icy driveway, but I’d still put something underneath it to be safe. Something like a large, cheap rug to stick underneath it would be ideal if you want to use it on smooth/slippery surfaces. That way you get grip and you keep your snowboard safe from getting scratched. The whole unit is very solid. After using it for 20 min, there were some minor scratches from my snowboard’s edges, but nothing major or noticeable. The plastic is pretty hard so you’d have to really slam your edge into it to do much to the plastic block. Pretty pleased with the unit on a whole. How does it compare to building your own wooden box? So the question is how does it stack up to building your own home-build wooden jib practice box. Would I buy or recommend it? Would I buy it? Heck yeah. Sure I can make my own board trainer with wood blocks and some nails, but it’s not this portable or light or as well finished as the Aratik Board Trainer. If your self-built wooden jib rail is anything like mine, it will be a little rough around the edges. There will be rough spots on the wood, splintering, sharp pointed corners that you don’t want to fall on and it’s kind of heavy and hard to move around. For me it’s all about saving time, energy and the easy storage and portability that make me love the Aratik board trainer. I can spend my time and energy to make something that’s heavy, hard to move around, hard to store and gives me splinters or I can just buy the Aratik board trainer and save myself the hassle. I’d definitely recommend the Aratik board trainer if you want the simple, pre-built solution for practicing snowboard tricks in the comfort of your home. ps: You can substitute the snowboard with a skateboard deck and some bicycle tubing to simulate a snowboard and bindings. You’ll find that a skateboard deck is A LOT lighter to practice technique with and you won’t get tired as easily. It’s also a lot easier to lift and rotate a skateboard deck vs. swinging around your snowboard on flat ground. In this blog: I bought the new Sandbox helmet with certified hard foam liner, so let’s test it out in this Sandbox helmet review. 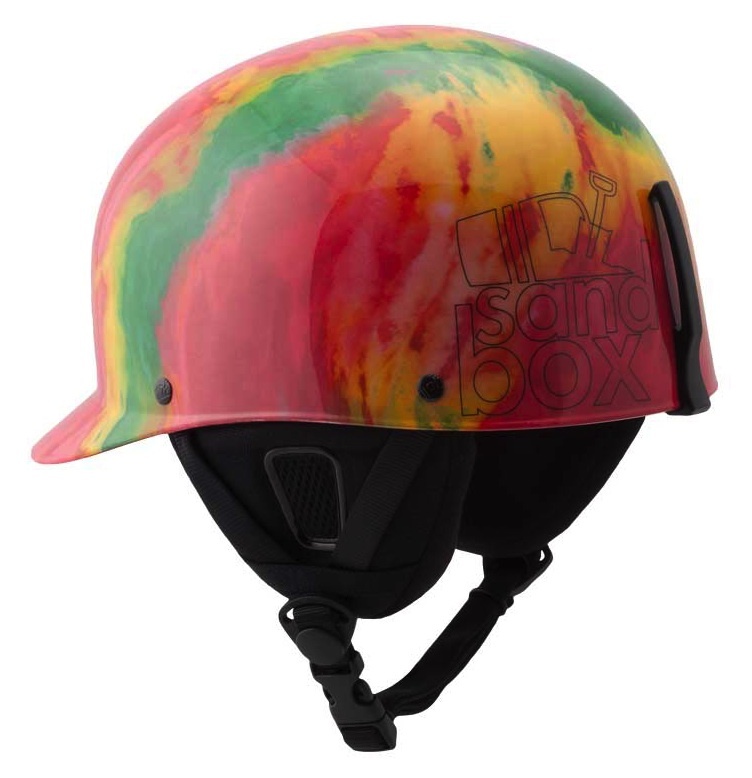 Since their original release, Sandbox helmets have been insane popular. 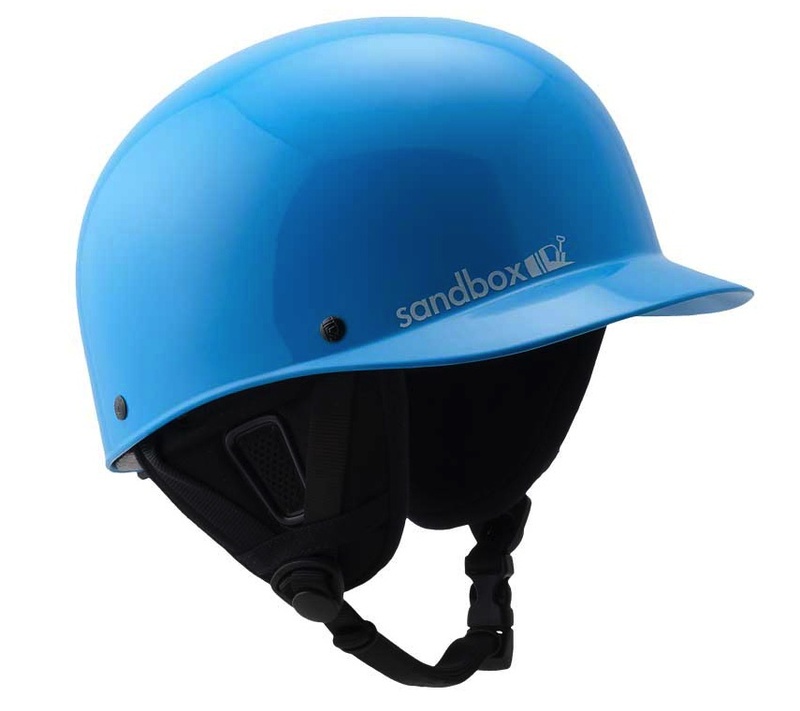 In recent years, Sandbox has updated their classic brimmed Sandbox helmets to add a new model, so let’s see how the new sandbox helmet holds up. If there was one drawback of the original Sandbox helmet, it’s that they weren’t safety certified for snowboarding. It was a standard hard hat design with soft padding on the inside, but there was no safety certification for those helmets. 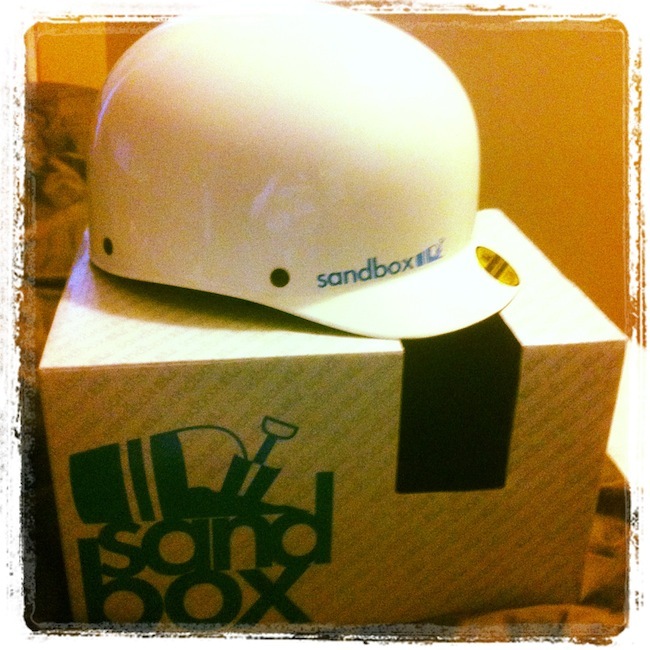 That original Sandbox helmet model is still for sale, which I reviewed here, but this season I picked up the certified version which includes a hard eps foam core that’s safety certified for sports like snowboarding. Here’s a look at the different liners. Basically, they took the old liner out and put a new certified hard foam liner in it’s place. So how does the helmet perform with the new liner? Let’s break it down. Firstly, it looks exactly the same as previous Sandbox helmets, which means it still sports the same low-profile design and the same baseball brim that originally made Sandbox helmets so popular. 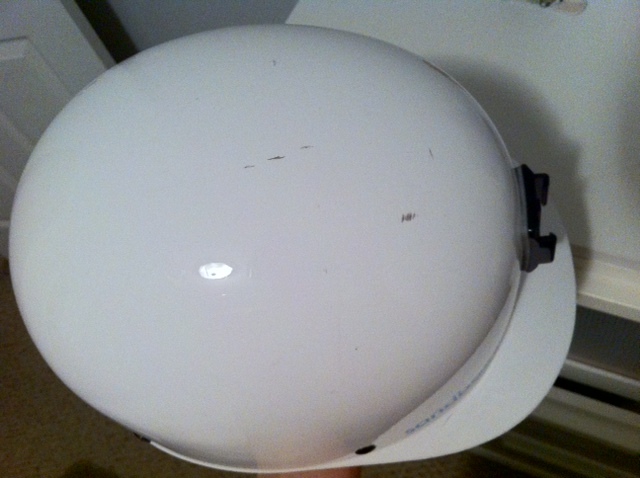 From the outside, you can’t tell the helmet apart from the original soft liner Sandbox helmet. It looks identical to my previous uncertified Sandbox helmet. I’ve always loved the colors available for Sandbox helmets and I’m happy to say that this helmet keeps with their tradition of having a wide range of color options. The color choices range from your standard black or white, up to brighter colors like blue and light green or even colorful designs such as rasta or camo. I went with the small/medium fit and was able to get a nice snug fit after swapping out some of the fitting pads. 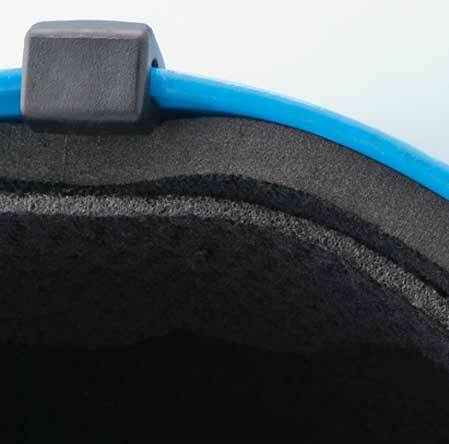 Depending on your head size, you may have to mix and match the foam fitting pads to get the perfect fit for your head. Is it as comfortable as the original soft foam liner? It’s not as comfortable as my original Sandbox helmet with the soft eva foam liner, but that was to be expected when I swapped to the new certified hard foam liner. 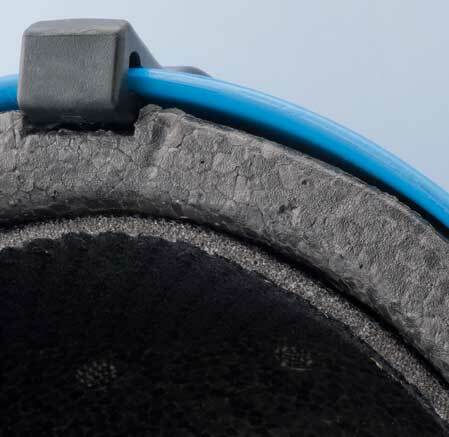 If you currently use any helmet with a hard foam liner, the feel is basically the same (since almost all certified helmets use the same hard foam lining anyway). Overall, it’s still comfortable to wear all day long and it didn’t shift when I was riding throughout the day, so I’m pleased with the fit and comfort of the helmet. The nice bonus of having a brim on the helmet is that it covers any gaps between your helmet and goggles. That way you don’t get the infamous gaper gap on your forehead. Overall it fits with every goggle that I’ve tried, but if you want to be safe I always recommend taking your goggles with you when you try on helmets. Just like the original Sandbox helmet, the outer shell is thin, hard plastic, which basically means it’s indestructible. I’ve fallen on my head, run into branches, trees and rails and the outer shell has never cracked. I can’t realistically see a way for anyone to break or crack the outer shell unless you want to wack it with a sledgehammer. Since it’s your standard hard foam liner, the foam liner will crack if you take a hard hit, but that’s exactly what it’s meant to do. Helmets with hard foam liners are designed to absorb impact and reduce the force on your head. If you crack the foam liner, that means it’s saved your head from getting a big knock, which is exactly what you want. Obviously this means once you take a big hit that cracks your liner, you need a new helmet, but this is the same for every single snowboard certified helmet available. It’s a great helmet overall. While I wouldn’t recommend it for people who get really hot helmet heads when snowboarding (no vents), for everyone else it’s a great helmet that allows me to ride all day long in comfort. 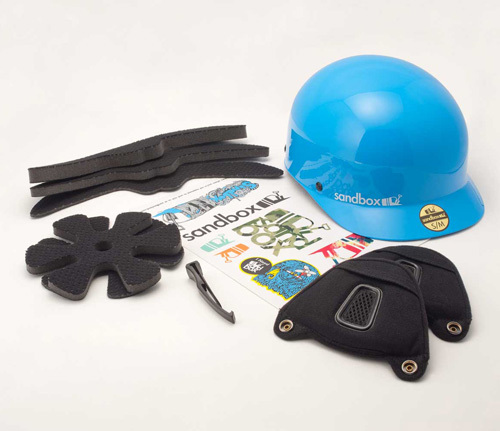 The bottom line is it’s the original Sandbox helmet that everyone loved, but it now has a snowboard certified hard foam liner to keep your head safe. If you’re in the market for a low-profile, non egg-head looking helmet, I can definitely recommend the updated Sandbox helmet with the certified hard foam liner. Hope you found this Sandbox helmet review helpful, let me know if you have any questions on the helmet. What’s The Best Travel Camera For Snowboarding? Indeed I do! Sport specific cameras that are shockproof, waterproof, freeze proof etc have become increasingly popular over the years. Between me and my many housemates, I’ve used most of the current models of ‘tough cameras. From all the ‘tough’ cameras I’ve seen, they all did the job of not breaking or getting destroyed by water damage. I couldn’t really say one is better than the other as far as toughness goes because unless you’re driving a car over them, they rarely break. In particular, I’ve thrown the Olympus Tough cameras into brick walls and taken it into hot tubs and ski hills and the only damage was the paint coming off the casing. So, since I can’t separate them by toughness, let’s go narrow it down by photo quality and compactness and ease of use. 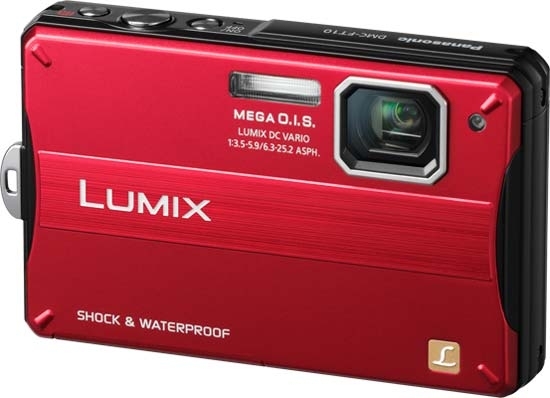 How good your photos look is probably the most important feature, besides toughness and overall I’d say the Canon Powershot D10 and Panasonic Lumix FT10 took the best quality photos. Unfortunately, the Canon isn’t built as compact. 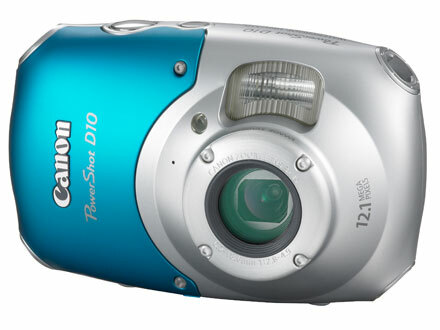 For whatever reason, Canon decided to make the Powershot D10 an odd, round-ish shape. This makes it take up more space in my pockets and makes it less slim as well. However, out of all the cameras, the Canon D10 was the easiest to use. Canon has a lot of practice with making user friendly cameras, so it’s not surprising that their menus and navigation were the easiest out of all the cameras. As I mentioned before, the Panasonic Lumix FT10 takes great photos. Roughly, on par with the Canon and a level above all the other cameras. It’s also a lot more compact than the Canon. It’s a standard square shape without any of the weird round features that feature on the Canon and it’s a lot slimmer too. The one downside – if you can call it that – is that the camera wasn’t as easy to use as the Canon. Don’t take this to mean it’s hard to use, but rather, Canon is just a level above the other camera manufacturers when it comes to ease of use. So which camera should you pick? Go with the Canon Powershot D10 if you don’t mind the slightly round-ish shape and want something that’s really simple to use. If the shape bothers you go with the Panasonic Lumix FT10. In addition, one option I didn’t talk about was the GoPro camera. GoPros aren’t so much meant solely for taking photos, but they’re amazing for taking videos and action shots. I wouldn’t get a GoPro solely for travelling around and using as a regular camera, but you may want to look at them if you’re interested in mounting a camera on your helmet/ski pole/hand and taking freeze frames and action videos while snowboarding. Hope that helps answer your question Matt! Back protectors are a smart way to lessen fall impacts to your back and help prevent impact injuries which cause fractures and broken bones. The RED Total Impact Back Protector is Burton’s version of back protection, so lets take a look and see how it performs. The retail price is about $100 US, but you can sometimes find them on sale for up to 20% off. I’m liking the black body armor look. The hard plastic plates on the back feel pretty solid and overall, it looks like a quality product. Honestly, it’s not the best fit. The back protector curves into a slight ‘C’ shape on your back. It’s a little aggressive and it feels like it’s pushing my back into a very slight hunch. 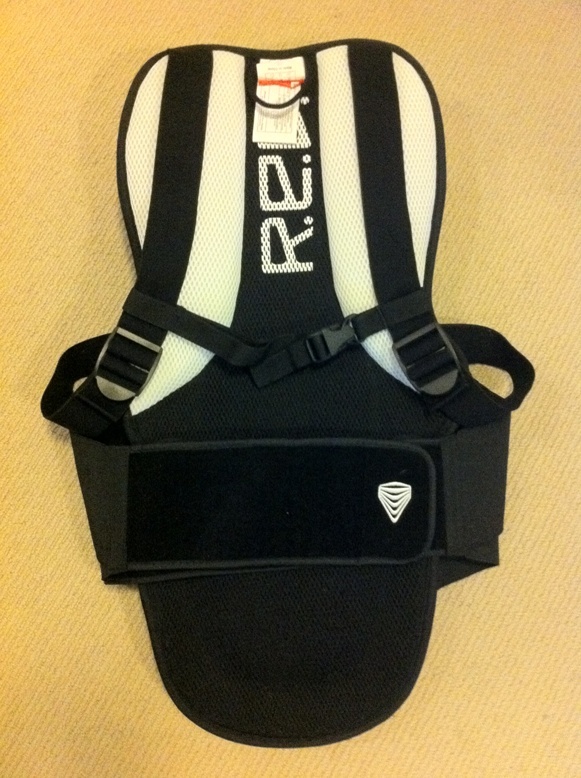 The padding and straps worked well and they do a decent job of keeping the back protector in place while on the slopes. Solid durability. I ride terrain parks 99% of the time and after many falls on rails and on jumps up to 75 ft, the back protector is still in good shape and everything still works great. It’s a pretty bulky back protector, but it does cover a large portion of your back. As I mentioned earlier, I’m not a big fan of the aggressive curve that forces my back into a slight hunch. I’d love to see them release their next model with less curve. I’m not sure how well the ‘Padded Vent Mesh’ works. The hard plastic area covers a huge portion of your back, way more than most other back protectors that I’ve used, but it also means it traps more sweat and heat in. I did notice that it was a little awkward sitting on chairlifts with large curved bubbles of plastic on my back. I’d prefer it if the plastic back bubbles were more flat for better comfort on chairlifts. The straps were comfortable and I didn’t notice them while on the mountain. Very good impact protection. It’s got the largest surface area coverage of any of the back protectors that I’ve used. I’ve landed directly on my back from huge jumps and I barely felt a thing. There’s no tailbone protector, but if you want tailbone protection, I recommend you check out some padded shorts instead. Do note that it doesn’t protect against spine compression injuries, but no back protector will prevent spine compression unfortunately. This back protector is a bit of a hit or miss for me. I love it because it offers the best protection of any of the back protectors that I’ve used, but I’m not a fan of the slightly curved shape that forces my back into a slight hunch. I’d recommend that you try it out at the store and see if the curved shape makes you uncomfortable. 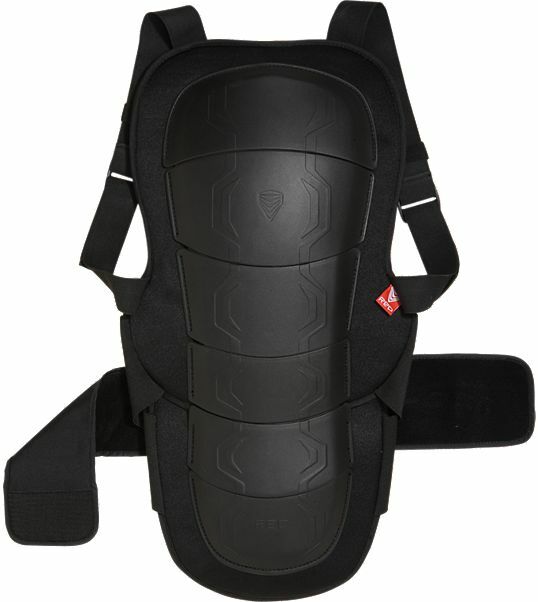 If you want the best back protection available, you should check this out, otherwise, you may be more happy with a slightly less bulky back protector. 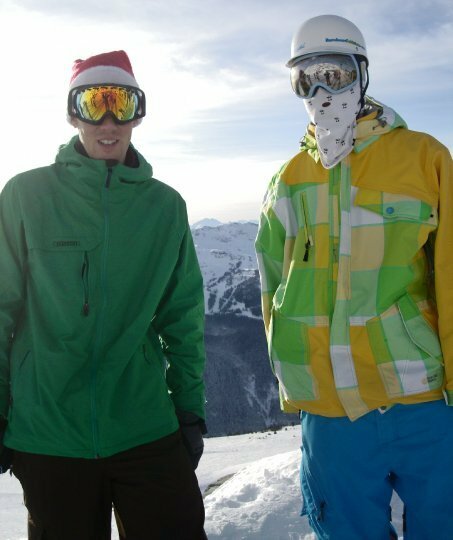 Facemasks are great for keeping your face warm and protecting you from snow and sun, but the problem is they can also make it harder to breath. Airhole facemasks are aimed as the solution to facemasks that don’t let you breath properly, so lets take a closer look and see how it performs! Airholes start at about $20-30, but you can usually find them for $10-20 on sale. It’s your classic bandana style look. I love that they have a HUGE variety of patterns and colors to choose from. Also, they make you look like a ninja. Who doesn’t like ninjas? My model came with the velcro closures and I found them to be good, but you are limited to the size range you pick. I had a Small/Medium sized Airhole and it worked well for me. They also offer their velcro bandanas in a large/extra-large, so make sure you get the right size! They do have a newer tie up model which eliminates the velcro, so that may be a solution for those who find the velcro closures too limiting. Overall it fits as you would expect, very similar to your standard bandana. It’s held up great over 3 seasons on the snow! The only possible weak spot would be the velcro closures which may come off over time, but mine are still holding in place after 3 full seasons on the snow. I had the standard polyester model and I found it pretty comfortable to wear. I do find that my breath makes it little bit moist on the inside of the Airhole, but the problem is a lot less noticeable than regular bandanas that don’t have an air hole over the mouth. I found that my face was a lot warmer on cold days as well, which is a plus! Does the air hole work? Yep! The problem with previous fleece/polyester badanas that I’ve owned is the air gets trapped inside the bandana and it can make it harder to breath. I never had a problem with breathing while using the Airhole. Airhole also gets a big plus for using polyester material. Polyester is far better than regular cotton which gets wet easily and sticks to your face making it uncomfortable and hard to breath. I’m quite happy with the Airhole. The only warning I’d give is that if you’re not used to wearing a bandana, the little bit of moisture inside the bandana might annoy you. Although. as I mentioned earlier, this problem is a lot less obvious with the Airhole thanks to the opening in front of your mouth. If you think the moisture might annoy you, I’d recommend you have a look at the mesh polyester Airhole, which lets even more air in and out of the badana. I think the most useful thing about the Airhole is that it protects my face on snowy days. As well as this, it’s been great protection from sunburn and goggle tans. Overall, I really like the Airhole and would definitely recommend it!